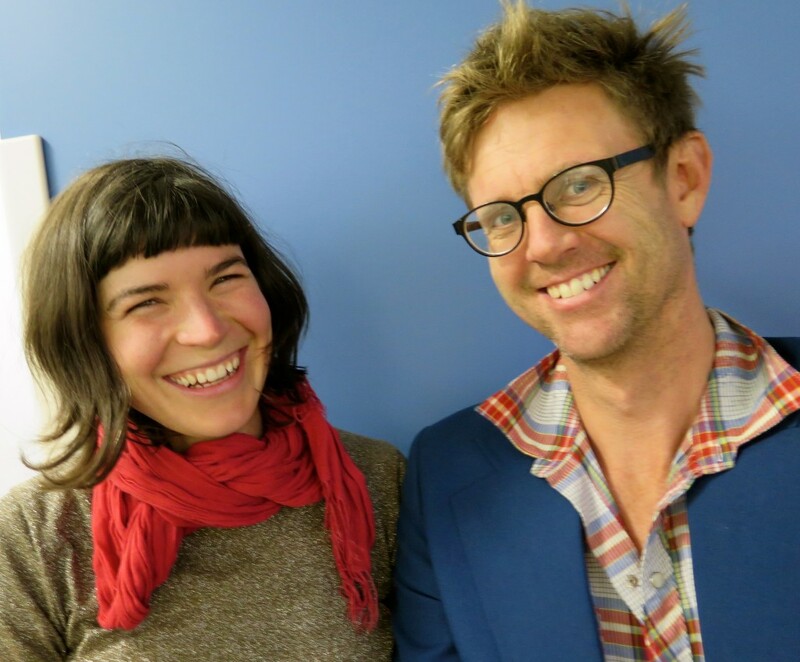 Today Good Life Permaculture turns one – yay! Why today? Well that was the day we officially went public, but it really started around 6 months before that, 6 months of dreaming, scheming, refining and early mornings (my preference over of late nights). This past year has been pretty full-on actually with a lot of work involving our heads, hearts and hands. 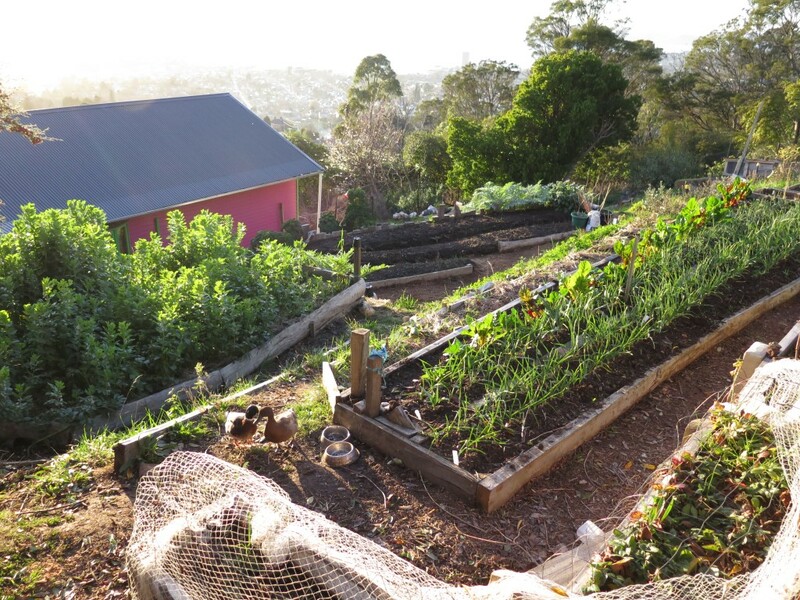 We’ve designed gardens, taught hundreds of people various skills in living sustainable and abundant lives. Poured our hearts into shaping our home and creating a meaningful livelihood. Dug so many holes, built a ridiculous amount of retaining walls and ended many a day with bodies so weary all we can manage is to lie down and not talk. Here’s a little photo journey of the last 1.5 years of Good Life’s work at home and in our community. The only reason we could afford to buy our place (with the bank) is because there’s no legal driveway to our place, just a 90m staircase (seriously). However we have some ace neighbours with a driveway and they let us use it to bring in the big stuff. It still means we have to double/triple handle all our materials and make crazy slippery dips like above to move materials around our property. But the job gets done, the trick it to just not think about it too much – otherwise you’ll do your head in. The back garden has now ‘settled’ into itself. 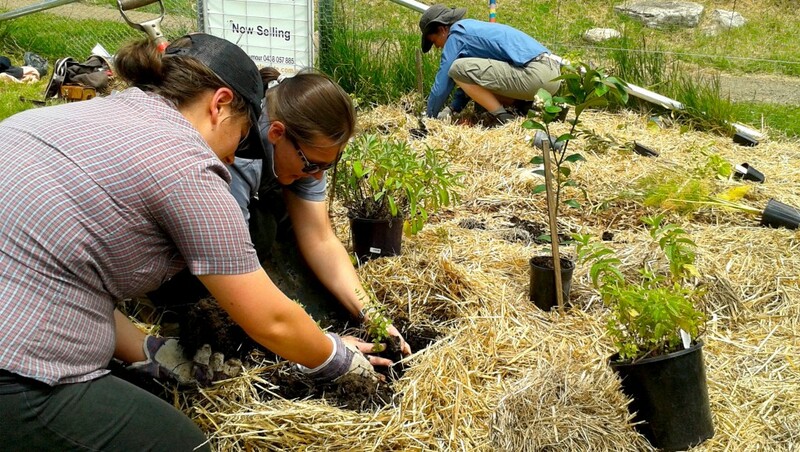 The edible forest garden is slowly maturing, the annual vegetable crops are mostly working and the herb garden is super pretty and productive. The swale pathways are one of my favourite elements in the whole place and the chook house continues to be a work of art (and a good home to the ladies). We’ve now just started to tackle our front garden, the excavator’s been through to shape the terraces, dig the rain tank overflow/greywater trench. The main bank’s planted with hardy natives (and covered with jute mat to help stabilise it), the rain tank pad (bottom right) is almost ready for the rain tank to arrive and geese – there’s still truckloads more work to do with fencing, planting, tree chopping and wood chipping. But we’ve started. It’s kind of scary to realise how shabby the house looked when we got here. 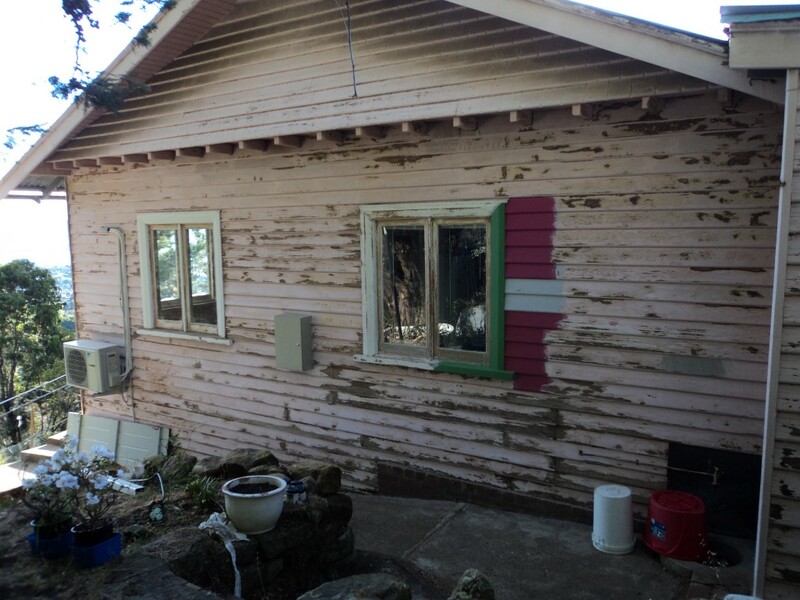 We prioritised painting the house pretty much straight away as the original paint was heavily contaminated with lead and was flaking off into the surrounding soil. Dealing with it straight away means we could focus on then developing productive gardens around the house without additional lead paint flaking into them. We understand this colour scheme isn’t to everyone’s taste – but to us, it’s the most beautiful thing we’ve ever seen. The unpainted latice area is ‘soon’ to be built in for a proper workshop and spare bedroom area. 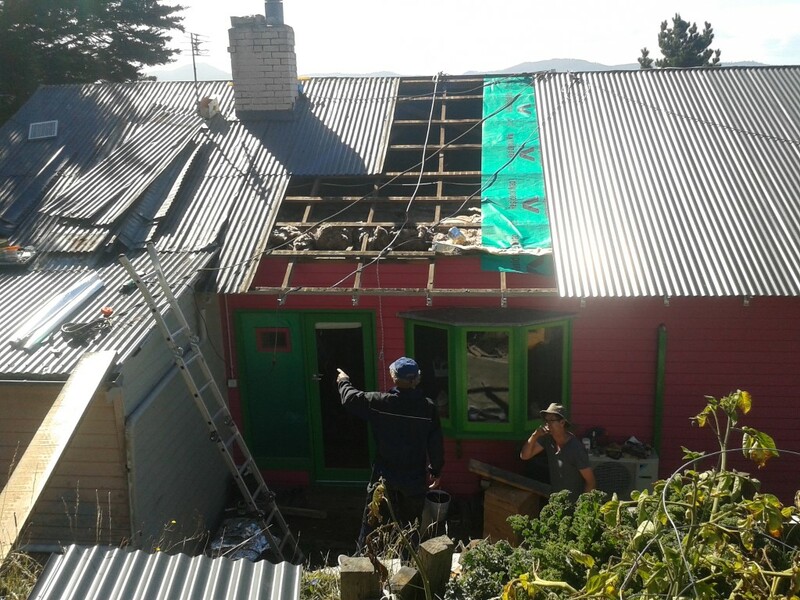 Re-roofing the house with the incredible help of Anton’s folks – one week of crazy power. Our roof had started rusting through and had been painted with lead paint so had to replace it before we could catch rain water or install solar panels. 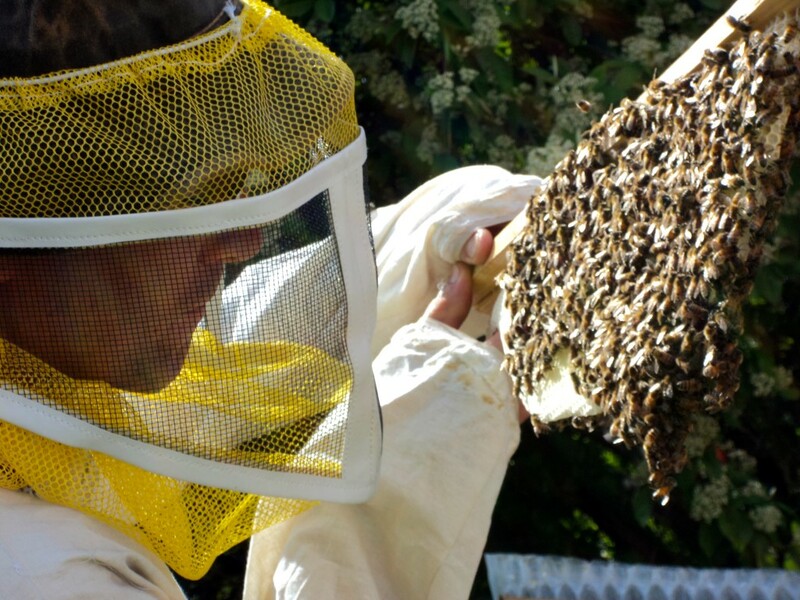 Anton built a sweet-as top bar beehive and someone gave us a small swarm of bees – this coming season we’ll get a few more hives under way as well. 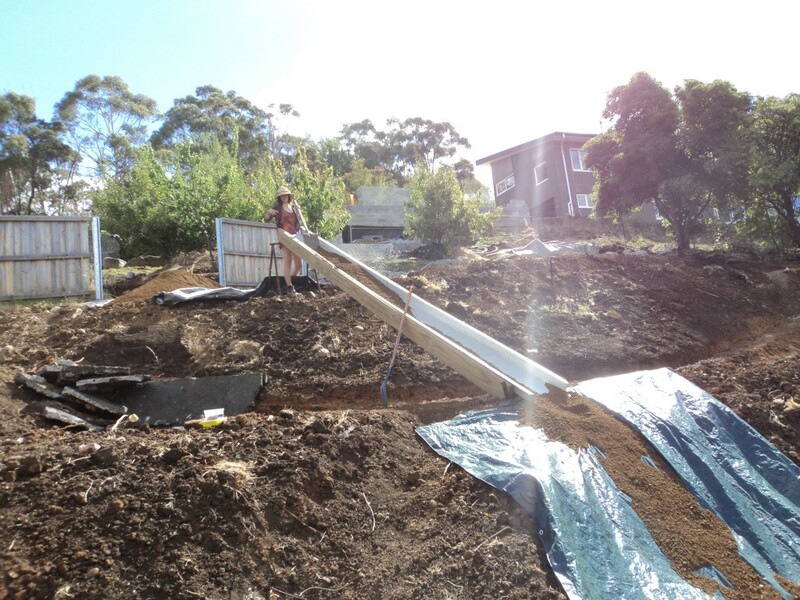 We’ve built pretty much every type of cheap and resourceful retaining wall you can imagine under the sun. This one’s an earthship wall in process which we’ve since rendered, but not quite finished. Me on our 90m staircase (our only access to our house) digging in a new water pipe as the old pipes made the water brown and had incredibly low water pressure. We’ve dug a lots of holes this past year. 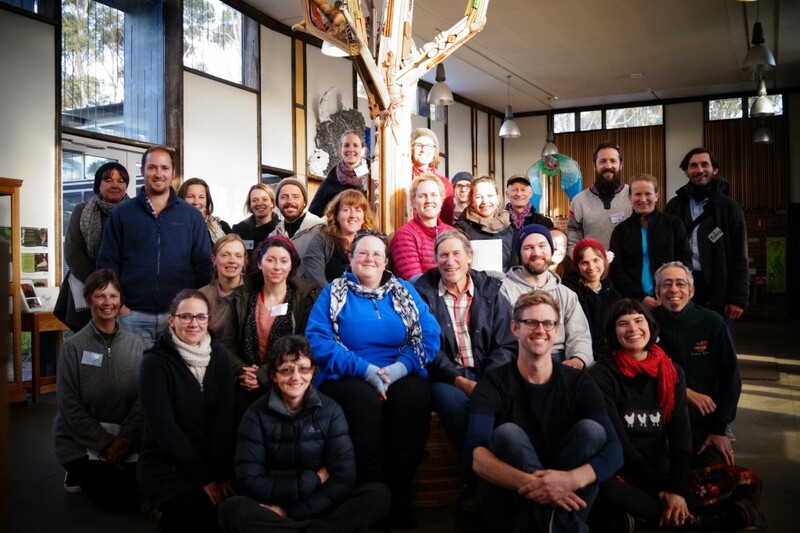 Throughout all this we’ve also been teaching permaculture skills to hundreds of folk across Tasmania to support them to live fantastic, sustainable and abundant lives. We’ve met some truly fantastic people in this time and are loving helping to foster a strong permaculture community throughout Tasmania. 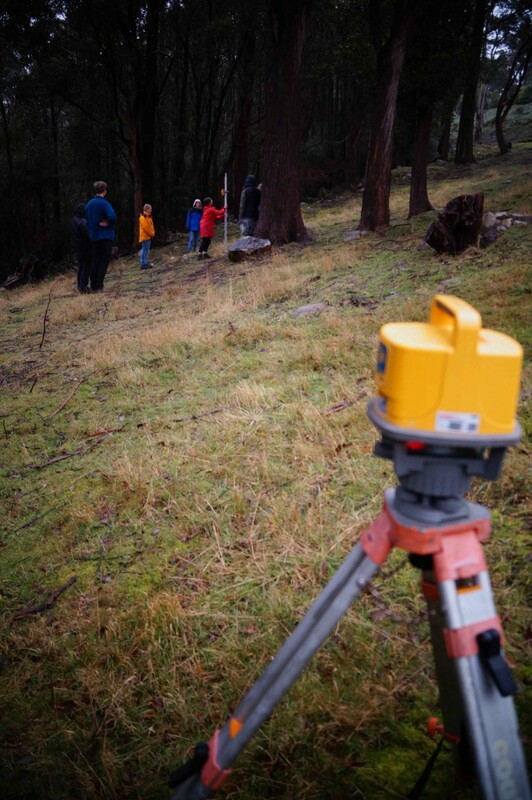 This has included partnering with Sustainable Living Tasmania to roll out two projects, Live and Learn (working with refugees teaching them how to grow food in a cold climate) and the Permablitz Project (transforming 5 urban gardens in productive permaculture inspired landscapes across Tassie) which we’re loving. Here’s a bit of a snapshot of it all. 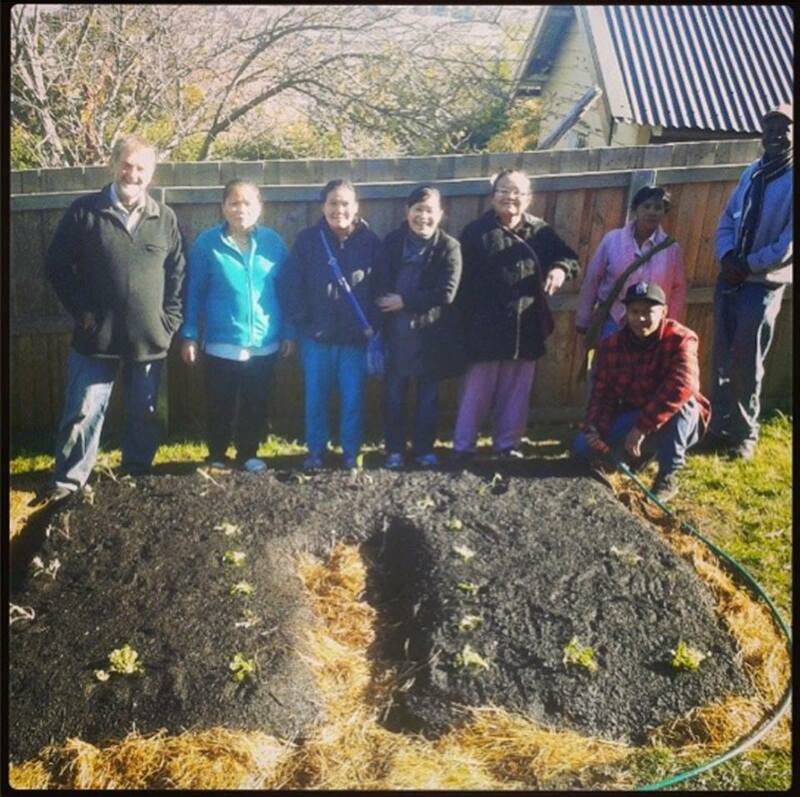 The Live and Learn project working with a family from Thailand to build a small kitchen garden in their rental property. 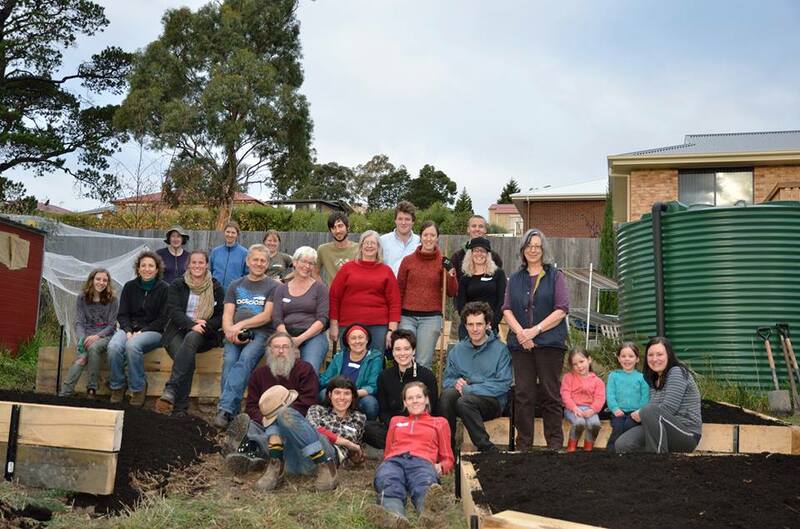 The Live and Learn project strikes again, this time creating a possum proof garden for a Sudanese family. 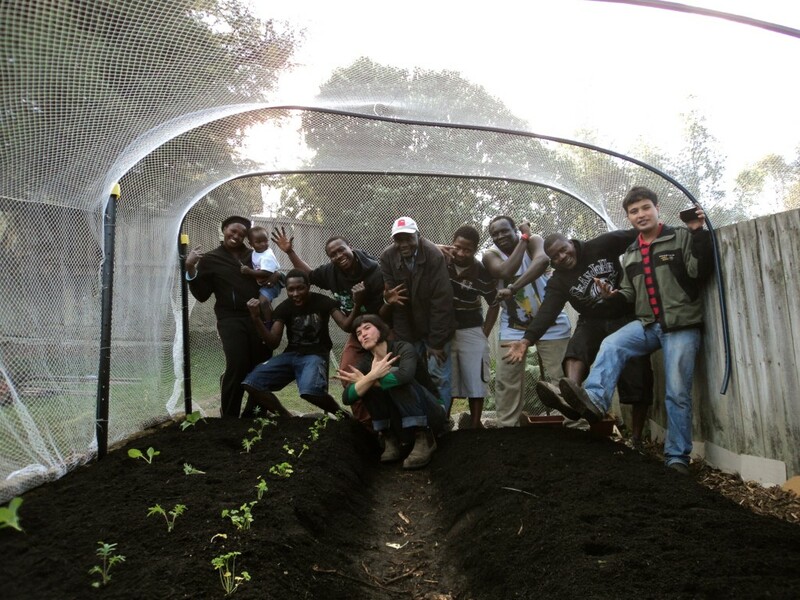 We had a lot of fun with this garden due to some seriously great attitude with the participants. 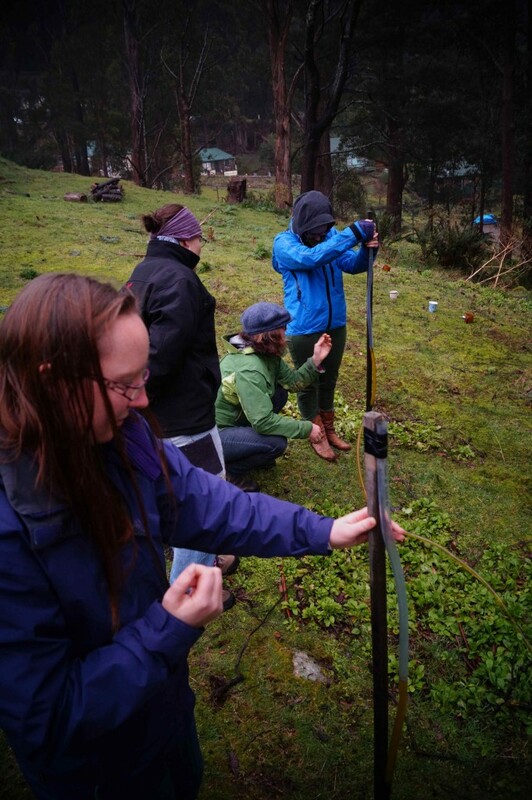 Our first Permaculture Design Course Dec 2013 held in Penguin, NW Tasmania. We’ve also helped run the national Food 4 Thought gathering, had some bumper harvests, done heaps of preserving of our garden produce and planted lots of garlic. And in other news we’re also about to start a little family – with a new person arriving into the Good Life world some time late December. So our second year is taking a turn for crazy land as we balance work, family and continuously striving for that good life. A massive, gigantic thank you to everyone for supporting us in all types of ways – whether that’s been through helping us in our garden, reading this blog, attending our courses, providing invaluable advice, being our friends or just sending through encouraging feedback every now and then. We can’t thank you enough. You warm our hearts and keep us on our toes – two critically important things. So how are we celebrating our first birthday? 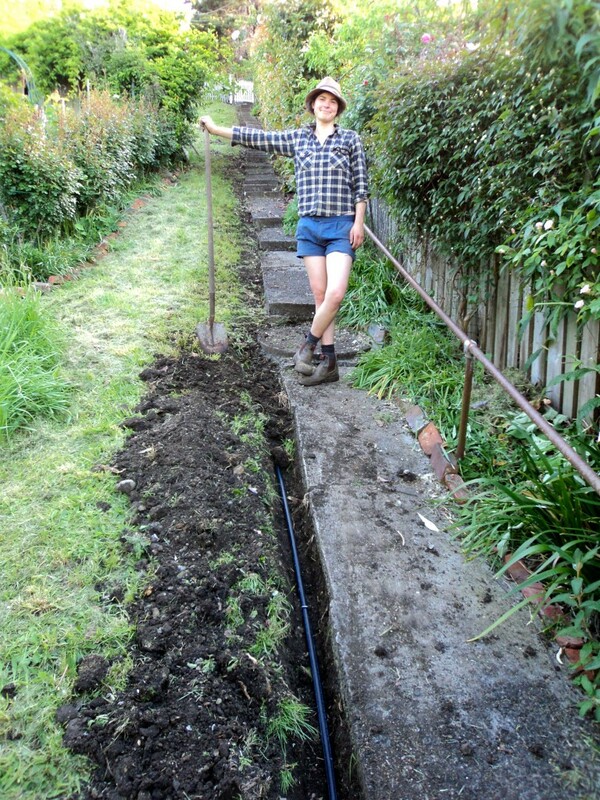 Well Anton’s in town working on energy efficiency projects with Sustainable Living Tasmania and I’m at home, digging trenches for the rain tank pipes and prepping the overflow/grey water trench. Happy birthday to us :-). 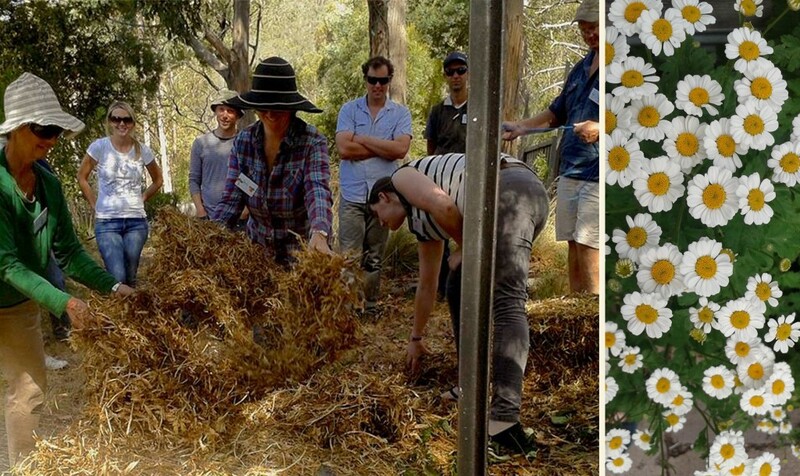 *Your blogger is Hannah Moloney, co-directer of Good Life Permaculture and lover of all things fun and garden-esk. 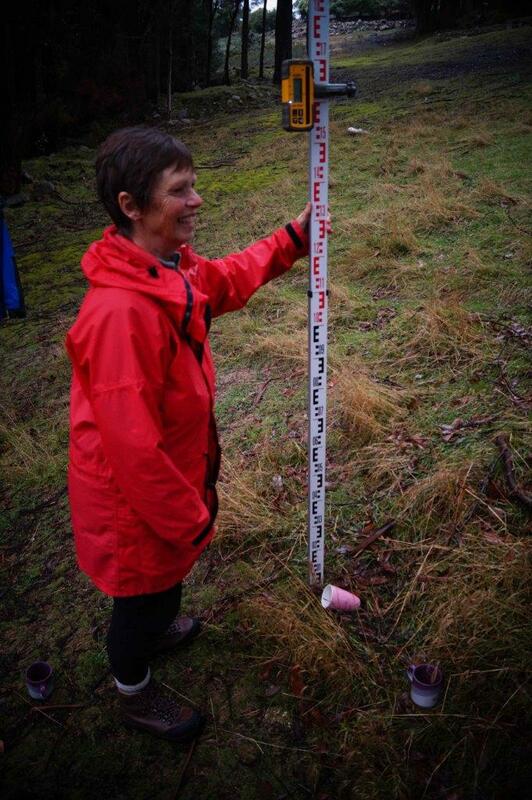 The term microclimate describes the climate of a small, specific place within a larger area. This could be a hillside on the edge of a city or an area as small as a backyard or park which can then have several different microclimates of their own depending on how much sunlight, shade, or exposure to the wind the space gets. 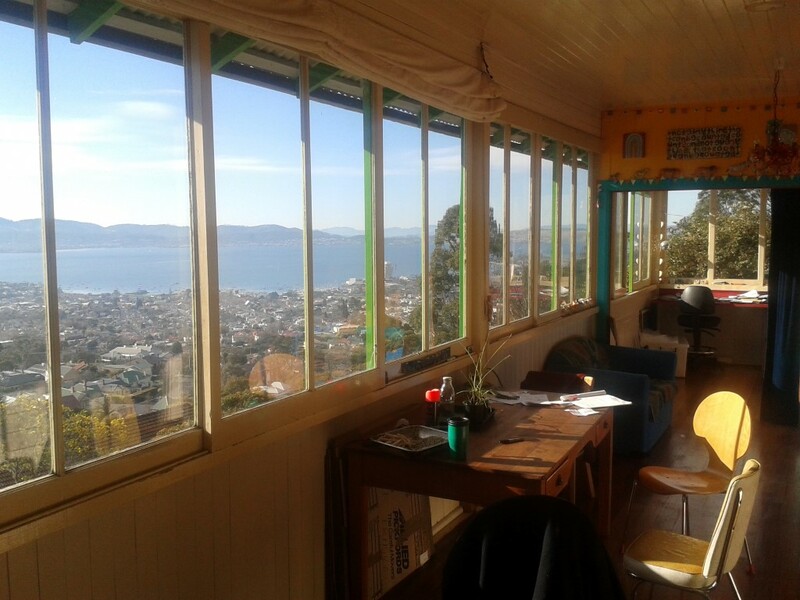 For example we live in Hobart, a cool temperate region – think frosty, cold winters with snow on the mountain and mild summers. However we live on N.E facing hillside on the edge of Hobart city where we’re protected from the full force of the wild westerly winds and the chilly southerlies. We only get mild frosts over winter and once we chop down some particularly massive cypress macrocarpa trees on our NW side, we’ll have all day sun hitting both the house and garden. Our property is also above the cool air drainage and harsh frosts that hits the valley floor (full of houses) below us. In summary, it’s a good spot. Within our property exist several microclimates. We have an area we affectionately call ‘Greece’ as it’s the driest, rockiest place with good warmth while another corner has been named the ‘Tropics’ as it gets the best sun ever and, being lower than Greece, we can channel water to it creating a moist and warm climate. No matter where you are you can create microclimates to enhance your food production and create super productive landscapes. 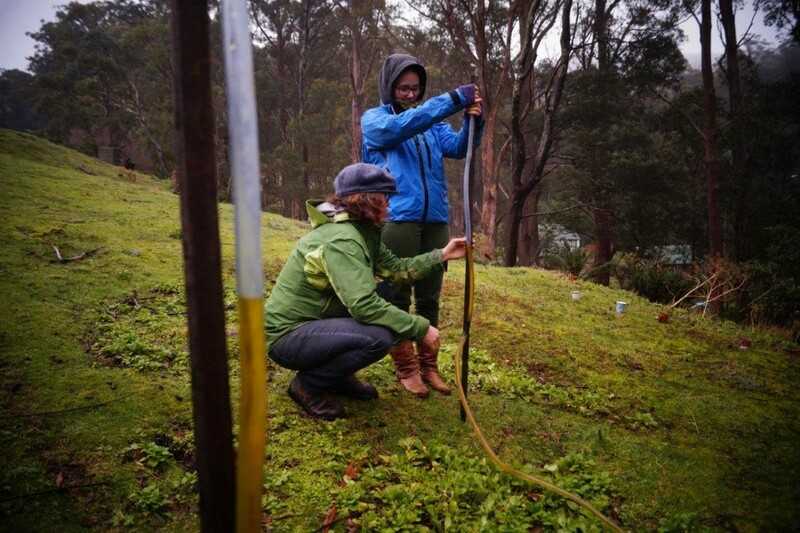 As we live in a cool climate region we’re completely focused on making WARM microclimates. 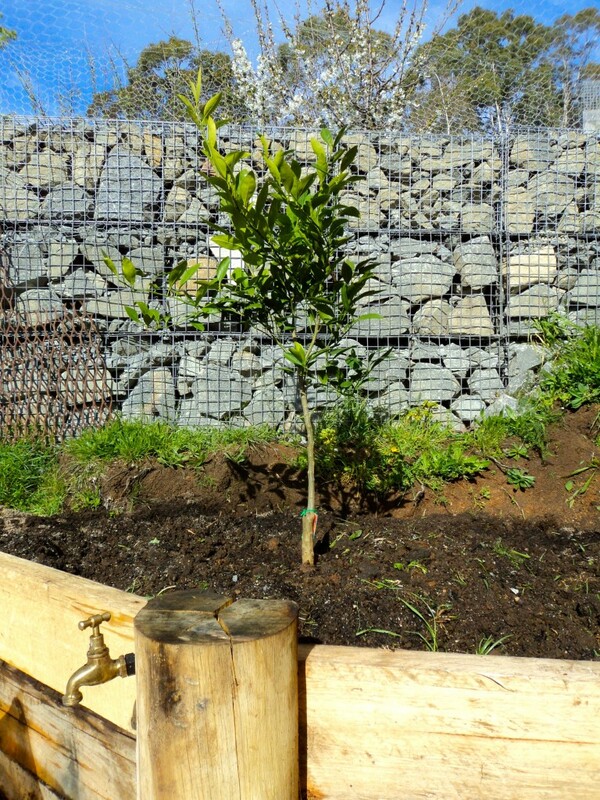 Example A is the gabion wall which we’ve planted a Satsuma Mandarin in front of. This is actually our neighbour’s wall but we helped build it and it sits on our boundary line, so we get to utilise it (yessss). We’re pretty happy to have a N.E facing rock wall acting as a massive slab of thermal mass, catching and storing the sun’s heat and making it available to the mandy. One of our other favourite microclimates on our property is actually inside the house (yes, microclimates exist inside buildings too). 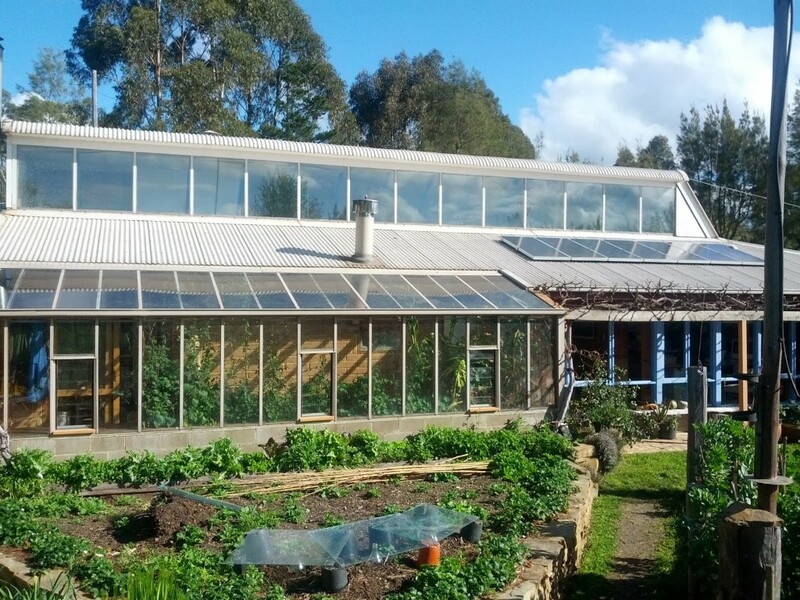 Our front sun room is 50% glass and we treat it like a hothouse, raising all our seedlings in their each winter for Spring plantings. We do intend to actually build a glasshouse in the garden, but haven’t quite got there yet. 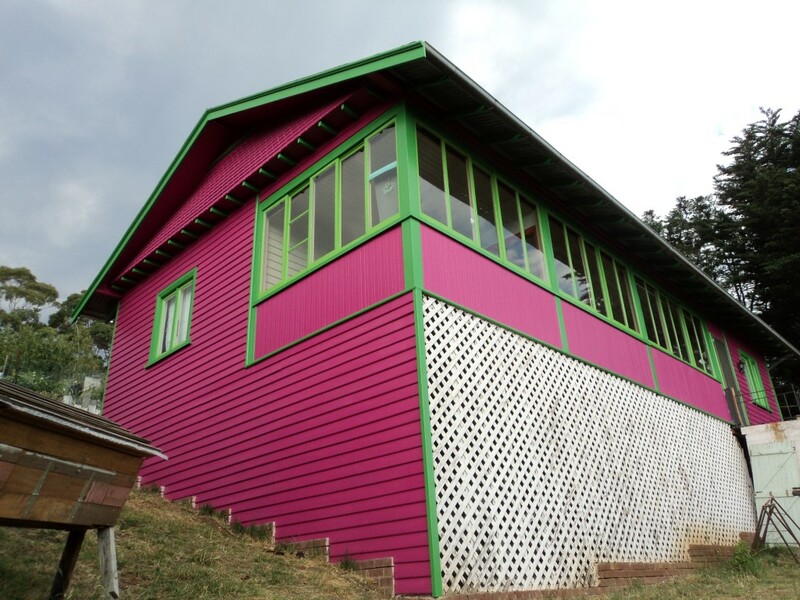 And then there’s David Holmgren and Sue Dennet’s home in Hepburn Springs, Victoria. Having designed and built their own mud brick house they’ve integrated a glass house into their home. Not only does it provide a kitchen garden pretty much in the kitchen, it also produces valuable heat which travels throughout the house, creating a toasty environment. Integration of home, garden and heater – beauty in action! 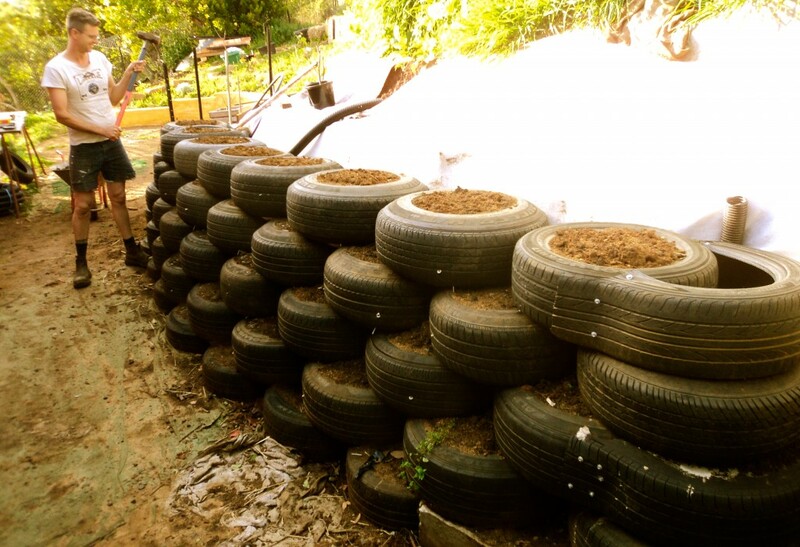 Another technique for the garden is something called hugelkultur, a method for growing food, composting large amounts of organic matter and creating a warmer microclimate all in one – in terms of being multifunctional, it’s pretty up there. Basically, it’s a raised garden bed full of rotting logs, timber offcuts and rich nitrogen materials (manure, food scraps, fine green waste etc) which generate some heat as they slowly compost. Eventually (after years) you’re left with beautiful brown soil. One thing to keep in mind is the type of wood you use, generally avoid (if you can) trees like cypress macrocarpa which are anti fungal and want break down for a looooong time, which is why this timber’s so good as fence posts. 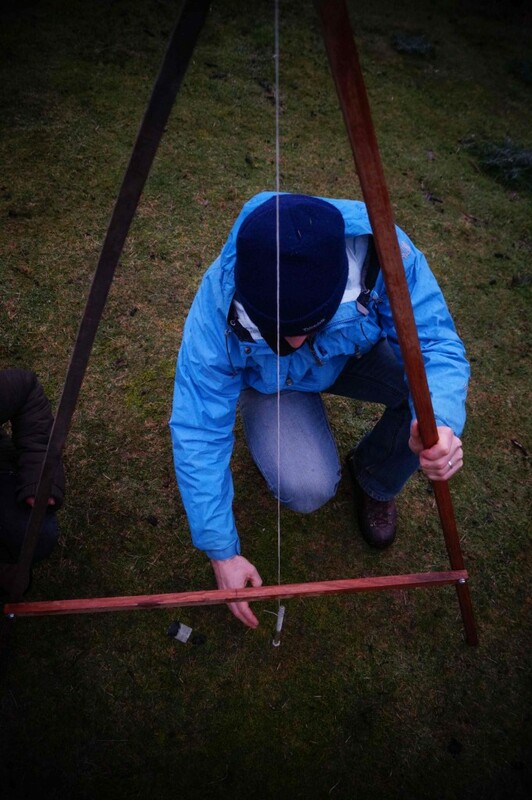 Timber that is ideal includes alders, apple, poplar willow (dry) and birch. 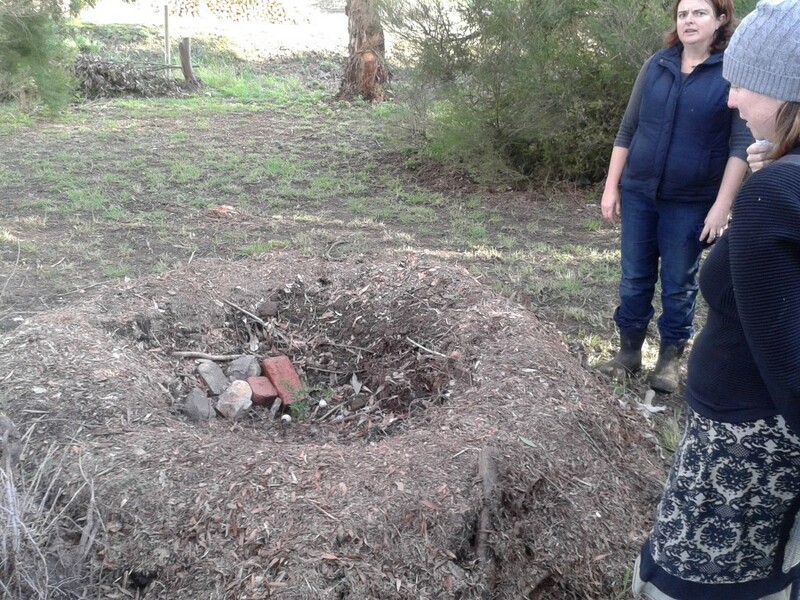 A local market gardener south of Hobart in Cygnet (Kylie Maudsley) is using hugelkulture to take care of the large amount of scrub she’s cut back, including making hugelkulture ‘donuts’ around her young bunya pine. This little microclimate is protecting the youngster from wind, generating extra warmth and providing valuable nutirents, so good! Kylie is also growing macadamias, she’s from Queensland and misses the plants from up that way. 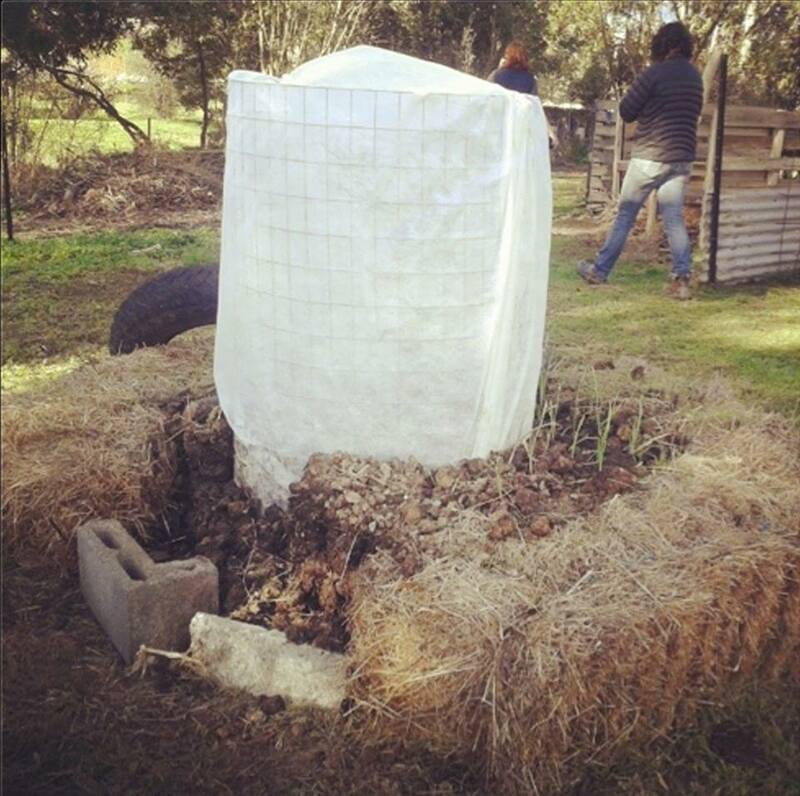 As you can see below she’s covered the macca with a white frost protection coat, then surrounded the lower half with a thick padding of manure with a final layer of straw bales to both generate heat and insulate the whole shbang. And then there’s water. Did you know that water bodies of any shape and size (from buckets to dams) are effective ways of creating heat sinks throughout your property? On an evening where you’re expecting frost the next morning, you can literally place buckets of water next to frost sensitive plants to help protect them. Water is a powerful tool to moderate climate, being a heat sink it operates as thermal mass – retaining heat and releasing it when temperature changes occur. This can create a small frost-free area for a longer period around it, thus giving a bit of a season extension. 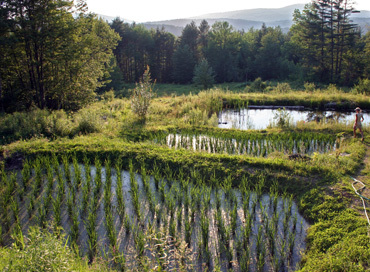 Permaculture property, Whole Systems Design, are based in Vermont and are experimenting growing rice in a series of ponds. Yes, that’s right, in Vermont. On his farm in Austria, Sepp Holzer has designed water into his landscape on a large scale, helping to creating warmer microclimates for the crops he grows around them. Furthermore, light is reflected off of the water surface. You can use this to your advantage by growing strategic plants directly around the water body which crave the extra heat. 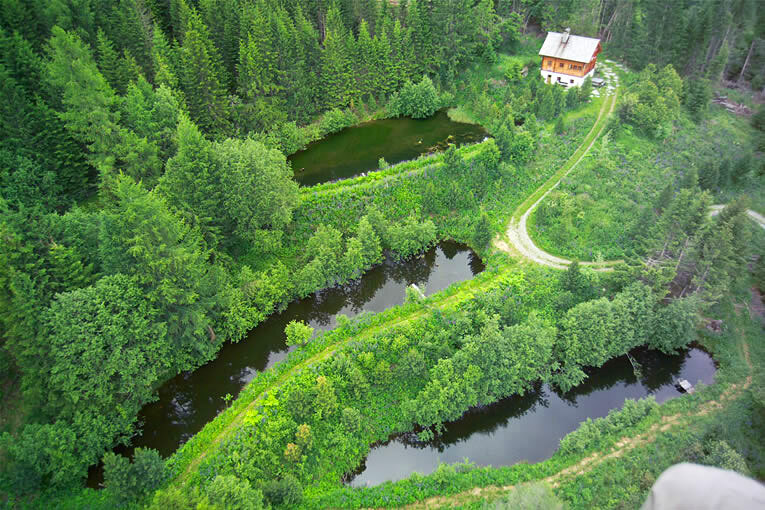 Appropriately placed ponds near houses can also give extra solar radiation for warming the house due to the reflection. 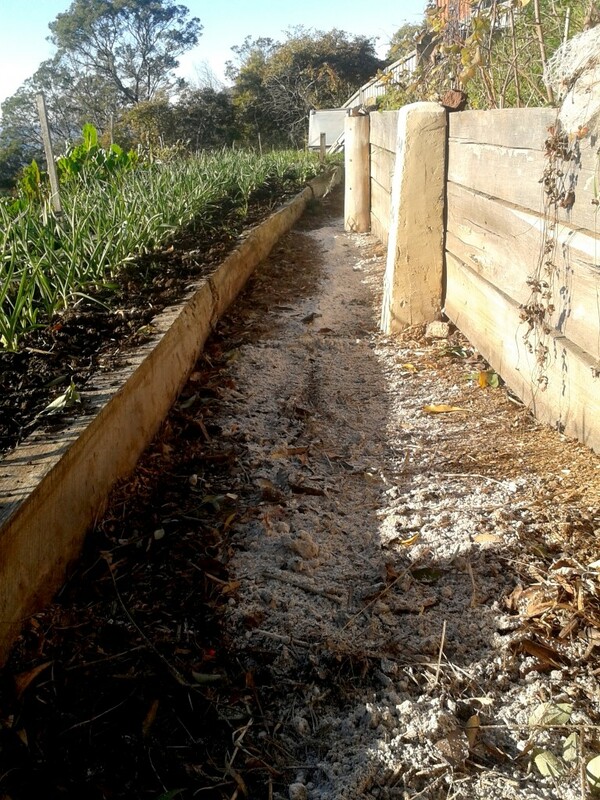 Pathways – by having white gravel paths you can reflect light back onto surrounding vegetation. Black paths function as a heat sink and slowly release that heat to the garden directly next to it. A brick/rock wall facing the sun provides the perfect microclimate to grow heat loving fruit trees and crops against it. 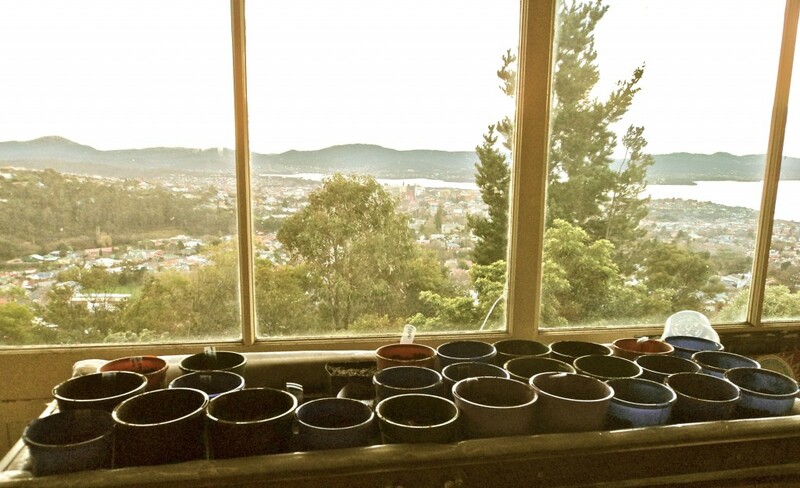 The great news is that there is almost ALWAYS a way to grow the crops you’d like to grow where you live. Although I’m not about to try and grow mangoes in Hobart but I will be giving avocados a good go! We predominantly heat our home with a wood fire which does a bang up job. 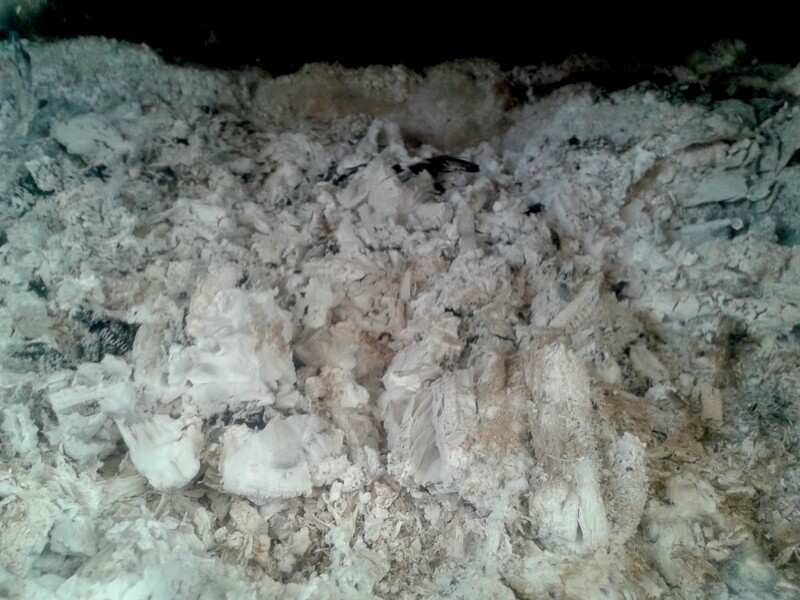 However dealing with all the wood ash that comes out of it has been a bit of a quandary for us. As a result we’ve had an impressive collection of boxes filling up with ash outside our back door, waiting for one of us to think properly about how we can integrate it into our property rather than putting it in the bin. 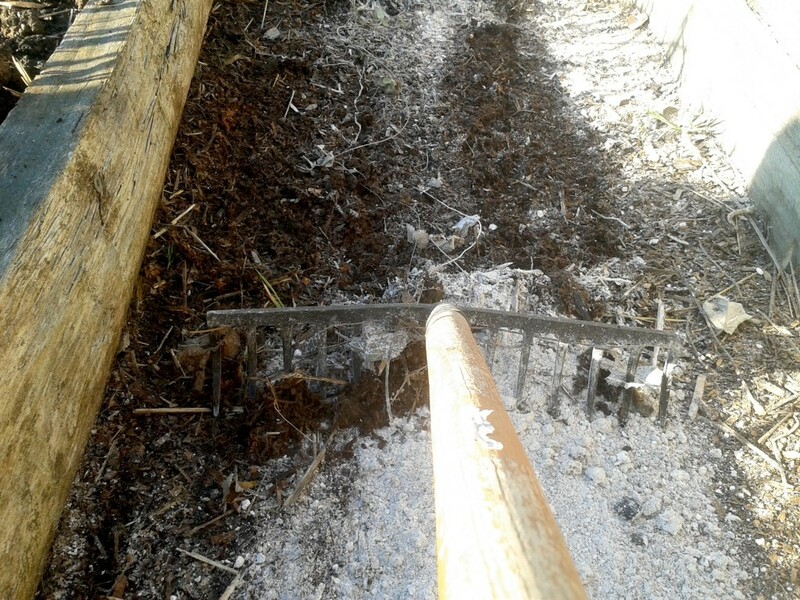 Because, while a little bit of wood ash on your garden can be beneficial – a lot of it generally leads to tears as it increases the alkalinity of the soil drastically, affecting the plant’s nutrition. 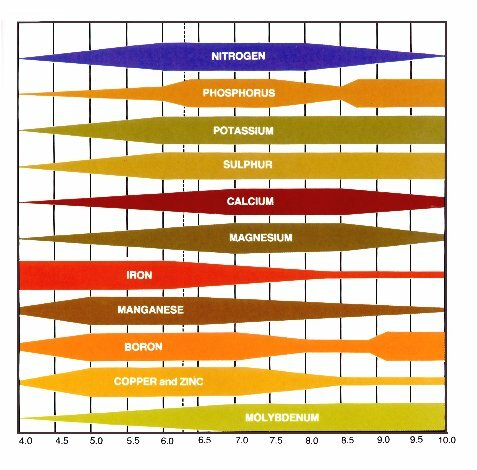 Nutrients are most readily available to plants when the soil reads 7 on the pH chart and wood ash can throw this out of balance, pushing this number up towards 10. “Since wood ash is derived from plant material, it contains most of the 13 essential nutrients the soil must supply for plant growth. When wood burns, nitrogen and sulfur are lost as gases, and calcium, potassium, magnesium and trace element compounds remain. 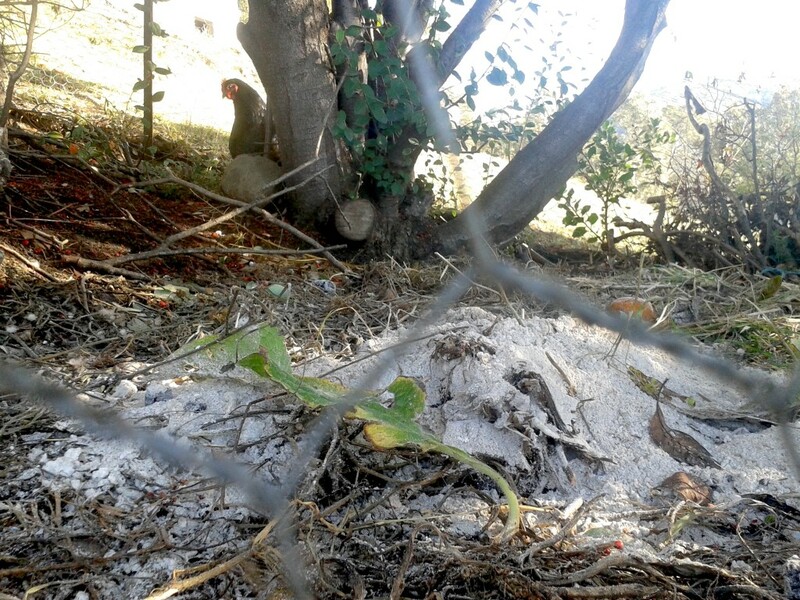 The carbonates and oxides remaining after wood burning are valuable liming agents, raising pH, thereby helping to neutralize acid soils” (soil scientist, Dan Sullivan). Of course, the fertilizer value of wood ash depends on the type of wood you burn. As a general rule, hardwoods (i.e. eucalyptus) yield more ash per kilogram of wood burned and contain a higher percentage of nutrients compare to ash from softwoods such as pine. However some plants, including asparagus, are more tolerant of slightly alkaline conditions compared to acid-loving plants, such as potatoes, rhododendrons and blueberries. Wood ash should never be used on acid-loving plants. 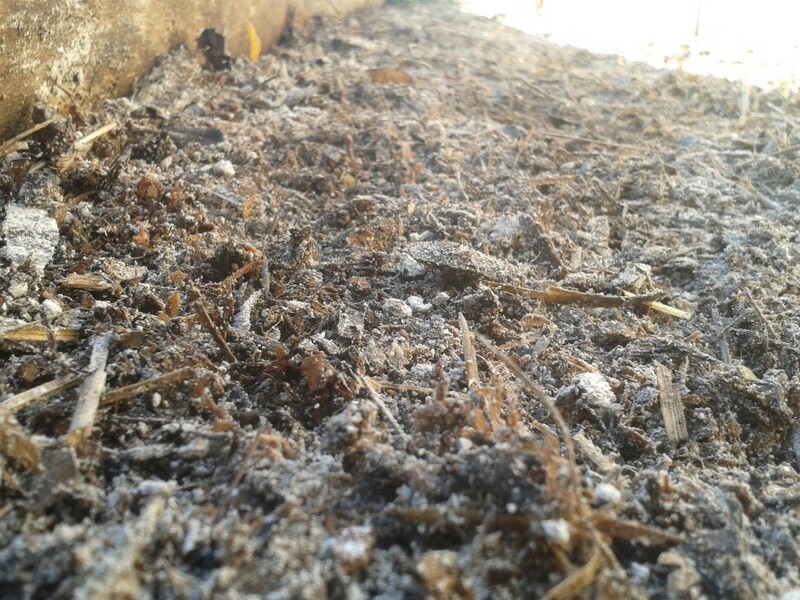 So while it’s well known that you can add small amounts of wood ash into your compost pile and spread some onto your vegie beds (it can help deter slugs from attacking your seedlings), I’ve always wondered what to do with BULK ash. At our place we’re trialing a little experiment in our garden which revolves around our ever useful and multifunctional swale pathways. Rather than putting a little bit of ash here and there, we’re seeing whether we can get away with bulk seasonal integration of wood ash going directly into our sawdust swale paths. Our swale path’s main job is to catch and store water, but they’re also slow in situ compost piles, meaning that one day, when the sawdust/woodchips have decomposed nicely they will end up on either a vegetable garden or in our orchard. With this in mind, it’s important that they have good mineral profile, we don’t want to mess with it too much, making it significantly alkaline or acidic. Currently we’re comfortable with the ash input, as the ratio of sawdust (mostly from hardwood timber) is high compared to the quantity of ash going into it. Saying that, we would still consider adding something like blood and bone (strong nitrogen content) to ensure it’s neutralised and perhaps even some pine needles (high acidic ingredient). Step 2: Vigorously massage the ash into the top layer of the sawdust. With time, rain and gravity the ash will settle deeply into the path, you also could water it in if it’s particularly dry in your area to accelerate this integration process. 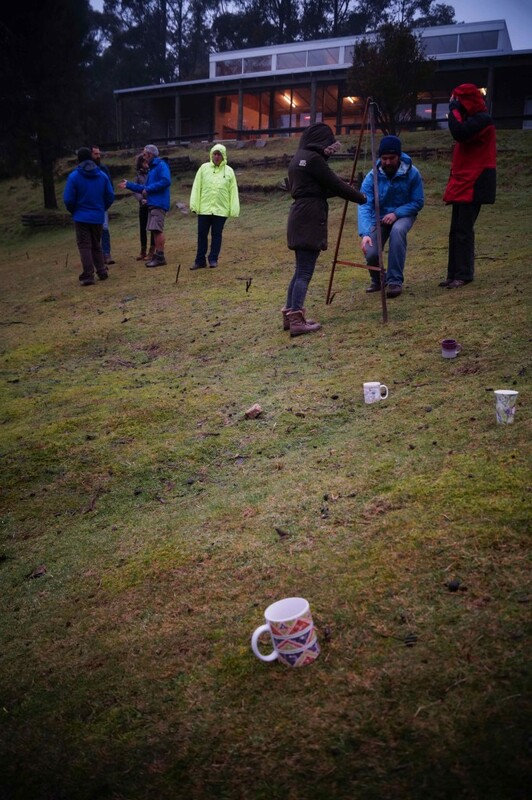 Step 3: Level it out with your rake and feet so it’s easy to walk along again. We also added a small amount into our deep litter chicken run which is another form of slow composting in action in our garden. We only put a small amount of ash in as chicken poo’s pH ranges from 6.5 – 8, 8 being fairly high on the alkaline chart so we don’t want to push it over the edge. But, in moderation we’re comfortable to add ash every now and then as a lot of plant waste and other other organic matter is being mixed in at the same time. As a way of processing ash in bulk, consider adding it into in situ slow composting systems like the swale path or deep litter chicken run. Where required add in other ingredients which can help neutralise (blood and bone) or acidify the contents (pine needles). The reason we’re so hell bent on keeping ash out of the conventional waste stream is because we’re big fans of nutrient cycling. We’ll do anything we can to keep nutrients onsite as opposed to sending them ‘out there’ where more often than not they transform into pollution. And also, it’s kind of fun to see how much you can really ‘close the loop’ in an urban environment – which is quite a lot!